Let me assure our readers that The Barn Journal remains primarily focused on barn preservation and related topics. 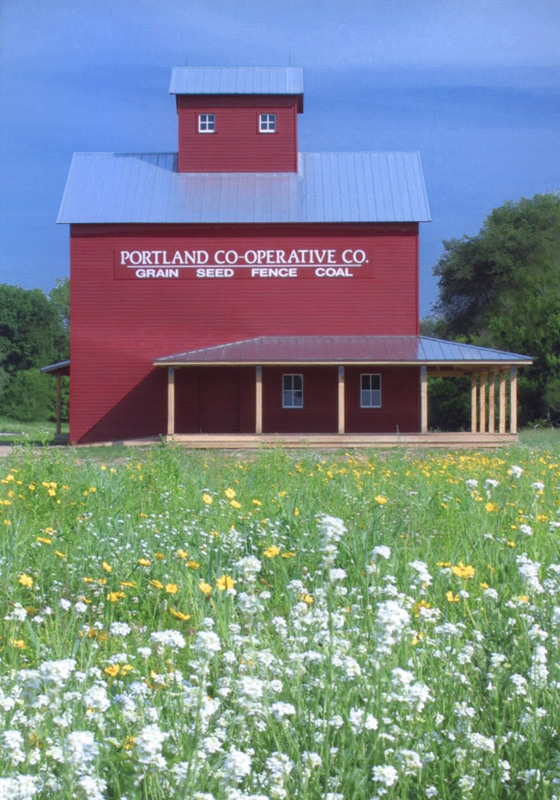 But, I hope you will allow an exception for The Red Mill, which has been a four-year long preservation project of my brother Ed and me in our hometown of Portland, MI. 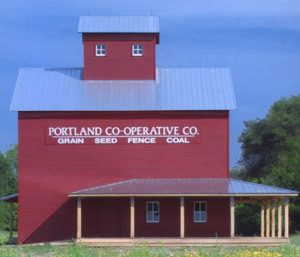 Ed and I decided that the best way to explain the project to Portland residents and The Red Mill visitors was to post information under a separate heading in The Barn Journal. My email indicates that many of you are seeking community support in saving barns and if you substitute "barn" for "mill" our experience may be useful. Click the image above to see a more detailed version. Photo by Steven Kahn, Portland, MI. We were fortunate to have a forward-looking City Council that was supportive of new approaches to enhance the livability and attractiveness of Portland. We explained our proposal as a partnership between private funding and the City, and the Council after public discussion and due prudence accepted our offer in fall 1998. During this period our families also debated the merits of proceeding. We knew that construction projects invariably run over budget, the logistics were daunting because we both live out-of-state, and "our plates were full" with careers and families. Ed and I finally concluded that saving the Mill was the right thing to do, and with enough anxiety over the outcome to make us respect the undertaking, we "jumped in" and never looked back. Although we committed to undertake the project without any City funds, we did request that City crews remove several appendages to the core building. In this and other areas of cooperation we were successful in establishing a good working relationship between the City Manager and his staff. The Council was promised that the renovated Mill would not require any substantial maintenance for 25 years. To meet that standard we installed new pre-stained siding and a new seamless steel roof. In the interest of authenticity the wraparound porch, which simulates the old loading dock, was constructed of locally milled native timber. We also made the south side that was formerly obscured by grain silos, the principal façade. This was done because the previous entrance was too close to Water Street and because the new face is more dramatic since it is seen for a distance by cars and cyclists approaching from the south. The Mill, which was originally acquired by the City for back taxes, reverted to full control of the City upon project completion. Although I believe the Council had confidence that we would complete the project satisfactorily, the City retained the right to raze the Mill if we didn't fulfill our part of the bargain. Ed and I learned that unlike the Field of Dreams it is not enough to "build and they will come"; you must explain and popularize the project. Residents needed to know the rationale to preserve a decrepit structure. I attempted to share our vision and increase awareness in a three-installment article in the community paper. This and other articles in the local paper (get to know the journalist!) sparked stories in other mid-Michigan publications. And going forward, the sign for www.thebarnjournal.org on The Red Mill will make it easy for interested persons to learn about the Mill's history, preservation and on-going activities. We are fortunate that several Community activists who are boosters of The Red Mill quickly recognized its possibilities as the site of a Farmers' Market. The Market began only weeks after project completion and in 2001 ran from mid-July to late October. The Market has in its first season already established itself as Portland's Saturday morning meeting place, as well as a source for fresh local produce and clever handicrafts. Ed and I are pleased with The Red Mill project and believe that, along with the River Trail, quality schools, the new City Hall, public recreational areas and the downtown revival, it has become a part of Portland's progressive image. If that is true, our efforts have been worthwhile, and we take a great deal of satisfaction in our role. If you have the opportunity for historic building preservation in your community, our advice is to "go for it"! Charles Leik is the Editor of The Barn Journal and resides in Great Falls, Virginia.